On the day of your trial make sure you are not wearing makeup and your skin has had time to breath before you start putting on more makeup. Go clean and product free. If you want to put on your daily moisturiser that is fine. For your hair, make sure you wash your hair the morning of the trial. The stylist can add products to help hold the hair but it is too difficult to work with greasy hair, especially in a hot weather country. Even though you may have sent photos to your hair stylist and makeup artist it is advisable to still take some more on that day. You want to make sure that you and your stylist are on the same page. Take pictures of things you don`t like also, you need to give her/him as much information as possible to get the look you are happy with. 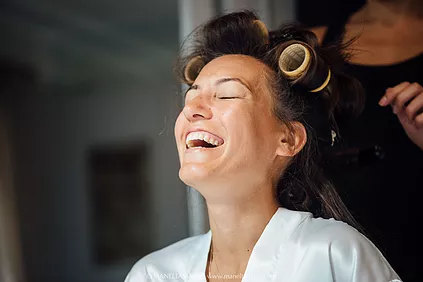 Remember if you are doing a destination wedding you would not have met your hair stylist or makeup artist before hand, so she/he can’t decide what style you should have on such an important day. As I mentioned before try to wear a white top, something with a similar neckline as your dress. If possible take your veil and any headpiece that you may be wearing on D day. You can even take your jewellery for this will help achieve a great finish. If you are using clip in hair extensions then make sure they are washed and clean ready to be used. Ask your stylist which extensions she recommends. I use Hair Rehab London since they are amazing and you will not be able to tell the difference between your hair and the extensions. If possible take a friend or family member to help you decide which style you liked best. The trial usually takes longer than on D day because you have not worked together before. It’s good to spend some time getting to know each other, don`t rush your trial. Ask in advance how much the trial will cost, so you are prepared on D day. If it is free or too cheap then it is probably going to be a disaster. Speak up. Don’t be shy, this is what the trial is about. You are there to work with your hair stylist and makeup artist to create your perfect look. Ask questions if you have doubts, even if they may seem silly to you. After you leave the trial keep a time on how the makeup holds up and for how long on your skin, if you need to make changes you can tell your stylist. The hair is more difficult to keep a tab on as you probably won’t leave with your hair in an up-styled. But if you choose to wear your hair down and loose, keep a time on how the curls hold. If you go for a loose beachy look the curls will obviously drop. Have fun as this is the time to start enjoying the last few months untill your wedding day.